I love wraps and burritos. I wanted to make a healthier wrap that would still be delicious and filling but without all the calories. I used low carb flatbread wraps that I found at Target the other day and I was impressed. The hubby loved them too. All in all they were a hit! Mix rice and seasoning together. Add remaining ingredients and stir until combined. Spoon filling into tortillas and roll leaving the edges open. Spray the edges lightly with cooking spray and fold over. Heat a large non-stick skillet over medium heat for 1 minute. Arrange wraps, seam-side down, in pan and cook until golden brown and crisp, about 3-4 minutes per side. Serve warm with a side of sour cream and salsa/hot sauce if desired. Enjoy! Hi! This looks great and I love that is healthy with a lot of fiber and protein. Thanks for linking up to The Facebook Frenzy Tues Blog Hop and for liking me on FB. 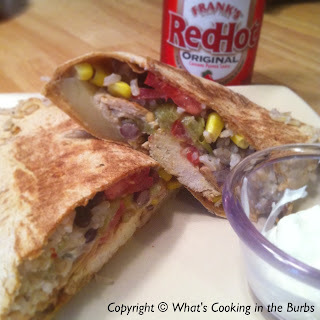 Pinned this recipe and now following you via GFC and FB. I'm always looking for new wrap ideas. Looks great! Thank you for linking up at The Busy Bee's party. We appreciate you sharing your great recipes with us! Hope you have a wonderful day!